Lifestyle diseases are increasing at an alarming rate across the globe. It is chiefly attributed to weight gain caused due to a sedentary lifestyle. The lifestyle also drives people to look for quick fix solutions for achieving rapid weight loss. Extreme measures for weightloss are never good. Here a few things that should just not be done while trying to lose weight. Smoking: Some people take to smoking thinking that it might help them lose weight since it suppresses hunger and keeps the cravings away. This is a popular method used by those with eating disorders. However, for an extra 100 calories burned per day, your chances of getting lung cancer also greatly increases. You could also land up with respiratory problems, bad breath, nicotine stains, dulled sense of taste and smell, and a whole pyramid of other physical problems. Starving/Fasting: This means that an individual consumes 500 or less calories each day. 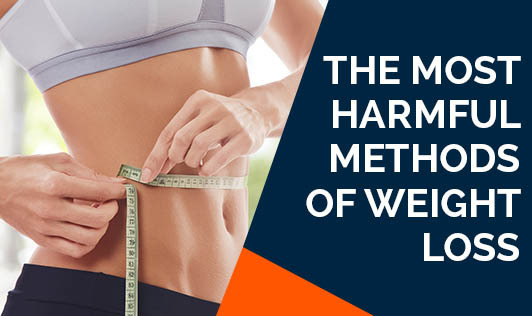 People occasionally resort to this weight loss method to counter overeating or any increase in food intake. Prolonged fasting or starvation can severely lower your metabolism; and lead to loss in muscle and bone mass, as well as damage your internal organs. Your energy and alertness may also greatly diminish; and in extreme cases you could even die. Detoxifying: Detoxifying your body using certain juices, liquids, or light foods is said to help rid the body of toxins, as well as help you lose weight. However, the science behind this claim is not yet clear. Depending on the product and regularity of use, cleanses or detox programs can have negative effects such as damaged nerve cells in the colon wall, electrolyte imbalance, stomach cramping, bloating, diarrhea, liver toxicity, and even depression if you don't lose weight. Crash Diets: There are many crash or fad diets that claim to help achieve long term weight loss. Dieters lose weight by eating a certain type of food while restricting all others for a period of time. Usually crash diets lead to ketosis, a state wherein the body burns fat instead of carbohydrates. Some long term effects of ketosis are loss in muscle and bone mass, increase in enzymes, and kidney damage. You do lose weight (mainly water) with crash diets but you can easily gain it back. You will also have nutritional deficiencies, damaged vital organs, and osteoporosis. Protein Powder/Pills: It is always recommended to consult a nutritionist, before including it in your diet, as when consumed in wrong quantities, it can produce many side effects such as flatulence, indigestion, bloating, and sometimes even organ failure. Therefore, consult your doctor and a dietitian before you start a diet.